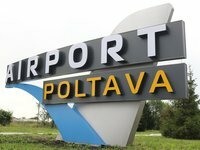 The Poltava international airport has serviced the first flight after reconstruction, First Deputy Head of Poltava Regional Administration Andriy Pesotsky has written on his Facebook page. "We have serviced the first flight after the reconstruction of the airport. Citizens of the United States, Canada, China and Europe arrived. They are not simply tourists, but bloggers and all those interested in aviation... I am proud that we have set the airport in order and now we can service flights both from other cities, and foreign flights," he said. According to the regional news portal Poltava News, the first flight of the airport is domestic, and a few dozen of foreign tourists flew from Zaporizhia by Yak-40 plane. As reported, on January 31, 2017, Poltava Regional Council adopted a program to develop and support the Poltava airport for 2017-2020 with the total cost of UAH 351 million. On December 20, 2017, the Cabinet of Ministers of Ukraine granted the status of the international airport to the Poltava airport.